It’s been over a year since I have turned wood, so I’m trying to get back into the groove. Like anything else, turning is a skill that must be nurtured. Unlike some other things, turning is fairly dangerous and requires an amount of muscle memory in order to dodge the piece of wood flying through the air at 200 miles an hour. 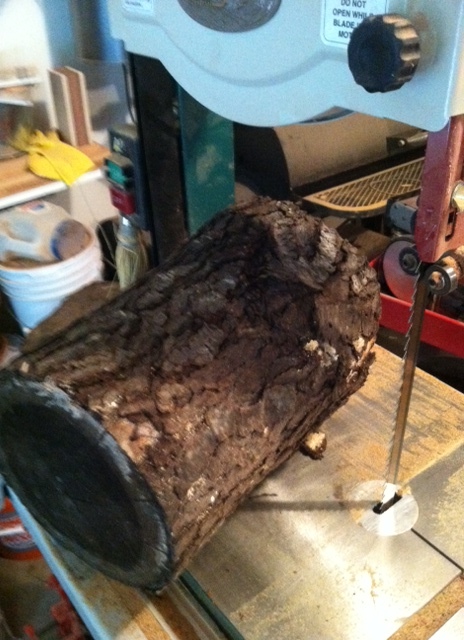 Anyway, to that end, I’m grabbing sub-par wood from around the house and making it into various things as practice. 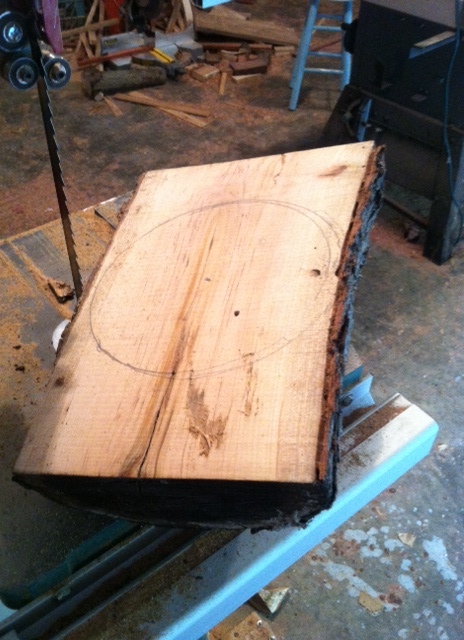 Below, is a series of pictures detailing the creation of a bowl from a piece of two year old firewood that had been sitting on the driveway for a long time. My apologies to the gorgeous black widow who I had to shoo off the log. Once cut in half, I drew out a circle and then cut that out. 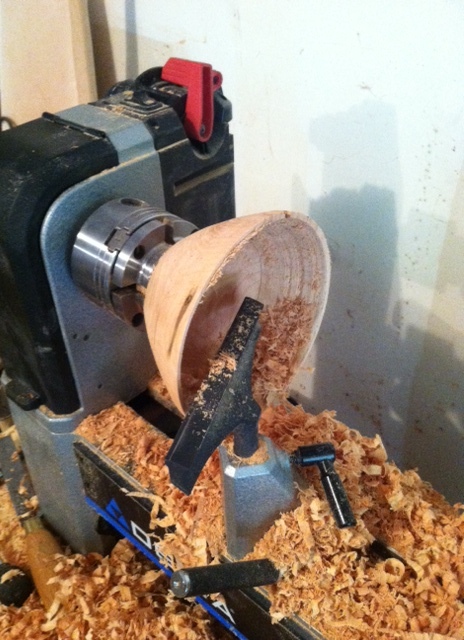 This allows the pith to run from side to side of the bowl instead of plunging my gouges into end-grain. This is my least favorite part. It’s roughing out the general shape and it tends to make my hands hurt. 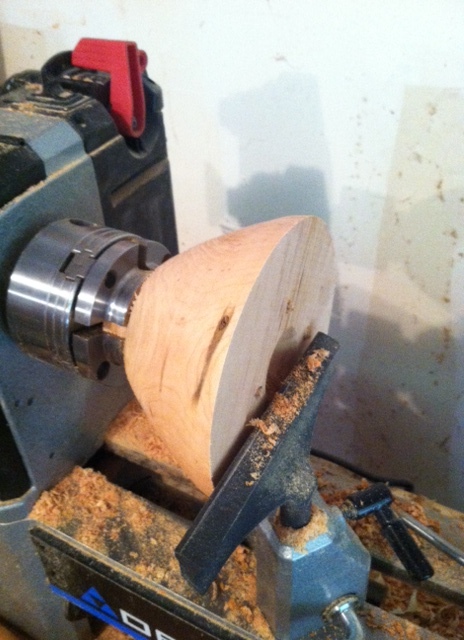 All roughed out and the tenon is cut into the bottom for mounting in my bowl chuck. Now it gets fun! 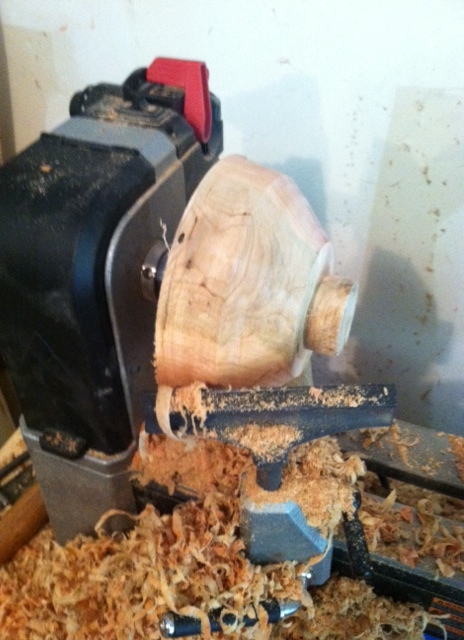 Once in the chuck, it’s quick work to clean up the sides. This isn’t the shape I was hoping for, but the wood dictates what it is sometimes, especially when using mostly rotten firewood. 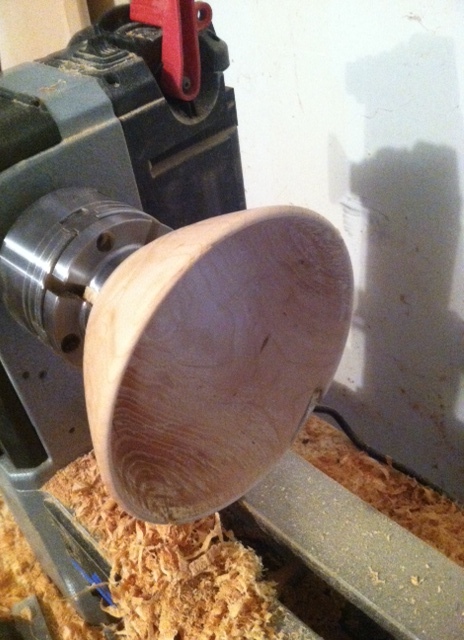 Few things are as fun as hollowing out a bowl. If you do it right the chips come off in long ribbons, even with really dry wood. 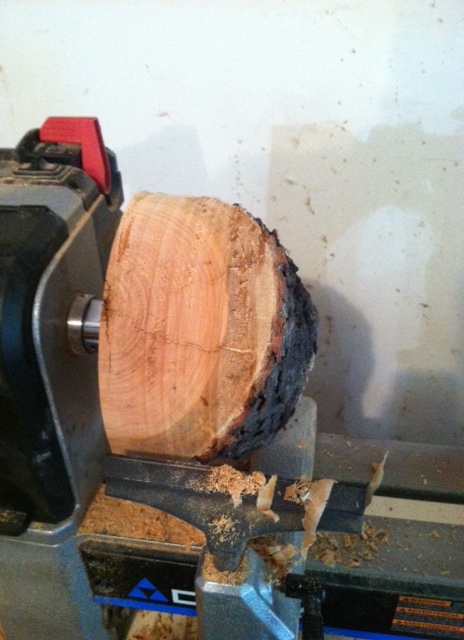 I have finishing gouges to clean up all the rough cuts from the regular gauges. After this all I have to do is sand and finish. And this is the finished product. It’s nothing special but I’ll fill it with candy or chips or something. Start to finish this took about an hour. This entry was posted in Wood stuff. Bookmark the permalink. 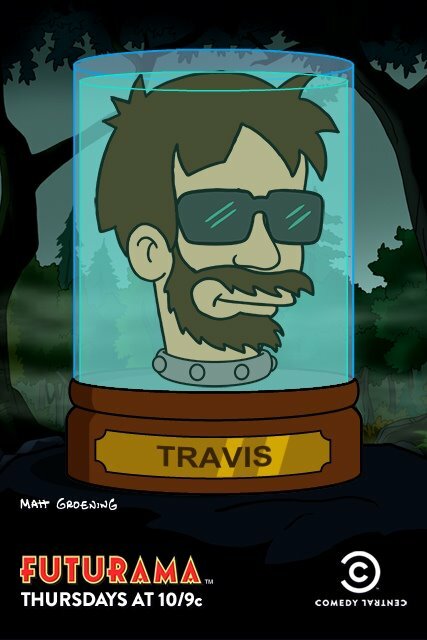 Super cool, Travis! It bowled me over! I am a very big fan of renaissance wax polish, which is what was used on this. 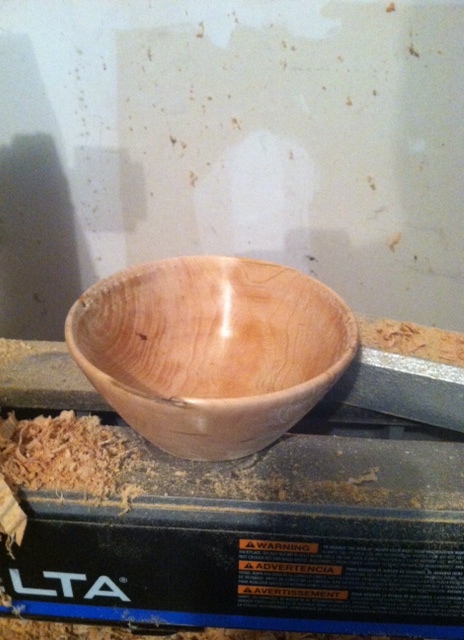 “Nothing special?” In my opinion, anything crafted by hand is special, be it a simple bowl to something more complex. I couldn’t do anything like that. Lacking the equipment aside, I’m a klutz. I’m sure I’d find plenty of ways to injure myself, so I’ll leave this to the experts and enjoy looking at the result.